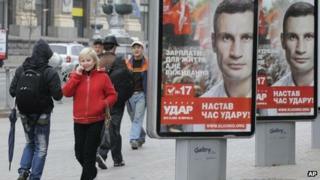 Ukrainian voters head to the polls on 28 October to elect a new parliament. With the exception of local elections in late 2010, this is the first nationwide ballot held under President Viktor Yanukovych since he came to power earlier that year. This is also the first election since 1994 in which the opposition leader, jailed former Prime Minister Yulia Tymoshenko, is not running. The election's conduct and outcome will have a major impact on Ukraine's future. It will particularly affect its relationship with the West, where concerns are growing about the state of democracy under President Yanukovych. It will also decide whether Mr Yanukovych will be able to consolidate his grip on power, and may even pre-determine the result of the presidential election scheduled for 2015. MPs in Ukraine are elected for a five-year term. Half of the 450 seats are distributed through a proportional system among parties, and the other half among individual candidates in single-seat constituencies. Most of the better-known candidates are running on party lists. Out of more than 80 parties contesting the election, only a handful are expected to make it into the next parliament. The most prominent are the two heavyweights and arch-rivals, President Yanukovych's Party of Regions and Yulia Tymoshenko's Fatherland. Other parties with a realistic chance of winning seats include Udar (which means "punch" in Ukrainian) led by boxing champion Vitali Klitschko, and the Communists, an ally of the ruling Party of Regions in the current parliament. Opposition parties have made attempts to present a common front, but remain largely disunited. Fatherland and Udar agreed to coordinate their nominations for first-past-the-post races, but the process has been marred by public disagreements. Yulia Tymoshenko, a bitter opponent of Mr Yanukovych, could not run in the elections after being sentenced to seven years in jail over a gas deal with Russia. She has since been charged with new offences dating back to the 1990s, including tax evasion and theft. Mrs Tymoshenko denies the charges, saying they are part of a vendetta campaign by Viktor Yanukovych. His controversial election as president in 2004 was overturned by the Orange Revolution, in which Mrs Tymoshenko played a key part. Mrs Tymoshenko's party, Fatherland, however, is contesting the election, with its campaigning being led by Arseniy Yatsenyuk, a former foreign minister and parliament speaker. Will the poll be free and fair? President Yanukovych has repeatedly given assurances that the election will be conducted commendably and described it as a "test of maturity" for Ukraine. His opponents, however, complain that campaigning has been marred by violations such as misuse of state resources by pro-government candidates, intimidation of activists and an offensive against free media. Western diplomats have voiced similar concerns. They also say that the vote's credibility has been dented by the absence of key contenders, such as Mrs Tymoshenko and Yuriy Lutsenko - the interior minister in her cabinet, who is now also behind bars. The manifestos of the major parties bear many similarities. They all pledge reforms to spur economic growth, higher wages, pensions and other benefits, better education and healthcare. The Party of Regions' campaign focused heavily on promoting its record as ruling party, contrasting the "stability" of the past two years with "chaos" during Mrs Tymoshenko's premiership in 2007-10. It advocates a "balanced" approach to developing relations with Russia and the West, saying neither should be given priority over the other. Fatherland paints the election as a battle of good against evil and promises to impeach President Yanukovych. The party says it advocates European values and promises to reverse the current government's policy of raising the status of the Russian language. In its manifesto, Udar avoids sensitive and polarising subjects, promising instead what appeals to as many people as possible, such as more empowerment to ordinary Ukrainians and a ruthless campaign against corruption. Many candidates in single-seat constituencies tend to focus on local issues, often distancing themselves from party agendas.